A Nutritionally Enhanced Daily Diet that provides the essential nutrients your pet needs for a long, healthy life. 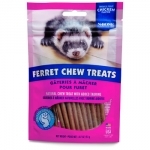 Marshall Premium Ferret Diet has a high protein content and ideal balance of essential amino acids making it the perfect diet for ferrets at all stages of life. Our patented low-heat process retains vital nutrients that other diets don’t, so freshness is guaranteed. Available in bulk quantities by the pound.